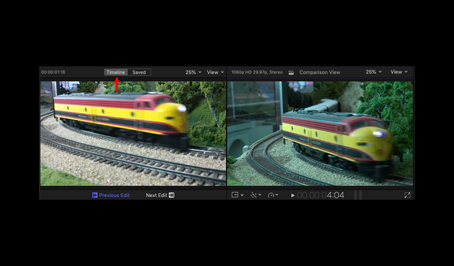 One of the more interesting new features in the 10.4.4 update to Apple Final Cut Pro X is the “Comparison Viewer.” In FCPX.4.4, you can show the comparison viewer next to the main Viewer to compare any two frames of video side by side. For example, you can compare frames to look for differences or similarities in color correction, cropping, titles, video effects such as blurs or masks, and so on. 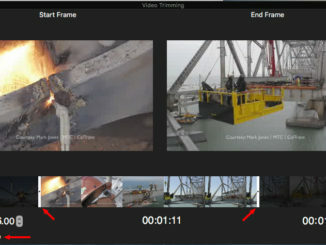 Timeline: Quickly compare a frame in your project with a frame from the previous or next clip in the timeline. 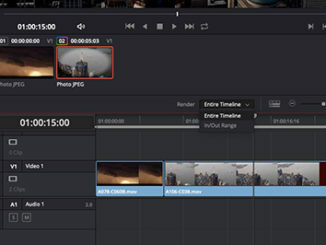 As you move the playhead in the timeline, the comparison viewer updates automatically to show either the last frame of the previous clip or the first frame of the next clip. Saved: Save frames to the comparison viewer so you can compare them to any frame in the timeline or the browser. In Saved mode, you can use the comparison viewer with a frame browser that shows thumbnails of your saved frames. You can save up to 30 frames from anywhere in your project or library, and you can display saved frames in the comparison viewer with just a click. The Saved display works similar to a a frame store, which is really quite neat. All images in the Comparison Viewer are stills. NOTE: You can’t display both the Comparison Viewer and the Event Viewer at the same time. Choose Window > Show in Workspace > Comparison Viewer (Shortcut: Control+Cmd+6). This opens a new window to the left of the Viewer. Make sure the Timeline text button is clicked, at the top. When Previous Edit is active, this window shows the last frame of the preceding clip. When Next Edit is active, this window shows the first frame of the following clip. We can’t change which frame is displayed in this window because it is based on how clips are trimmed in the Timeline. Click the View menu in the top right corner of the Comparison Viewer to enable a variety of options. The most useful of which are the video scopes. This displays the still frame in the comparison view displayed in the video scopes. All these options are similar to the options in the main Viewer, but now relate to the image displayed in the Comparison Viewer. NOTE: Remember, the Comparison Viewer only displays single frames, which won’t move. 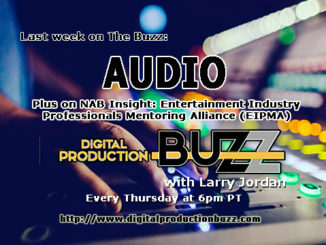 Read more, including a look at the Save Comparison Viewer, and some secret tips at LarryJordan.com here. Friday Funny: The Meg Are You a Good Shark Movie, or a Bad Shark Movie?